Traci J. Macnamara is a writer and literary adventurer. Her passion for books and remote landscapes has led her to explore historic huts in Antarctica, to climb to the summit of France’s Mont Blanc, and to backpack and climb in Southeastern Utah’s desert canyons. Macnamara’s writing has appeared in many magazines, journals, and books including Backpacker, High Country News, Vail Daily, Rocky Mountain News, the Patagonia catalog, and A Leaky Tent is a Piece of Paradise (Sierra Club Books, 2007), among others. 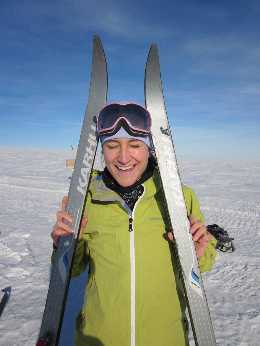 Macnamara has spent 25 months of her life in Antarctica working to support scientists at McMurdo Station, where she learned to Nordic ski on the Ross Ice Shelf and build a sturdy snow shelter. Macnamara has hiked and biked through France, following the footsteps of poet William Wordsworth to the Alps, and she spends her winters skiing in and around her hometown of Vail, Colorado. Macnamara has an undergraduate degree in science from the University of Notre Dame and master’s degrees in English literature, writing, and curriculum and instruction. She has also been trained as a Wilderness First Responder and in Avalanche Awareness, Level I. Set out confidently on your outdoor adventures by having the skills you need to take care of yourself and those in your group. Remember: Adventure begins in your backyard, whether you’re steps away from your starting point or a train ride from the nearest trailhead. I thought to name this blog “Down and Out” after reading George Orwell’s Down and Out in Paris and London. I read the book while I was doing some research in Cambridge a few weeks after I had broken my ankle in Chamonix–an event that prompted me to consider what I would do when the $54.26 remaining in my bank account ran dry. In that moment, Orwell’s subject matter felt particularly relevant. I like how Orwell was able to capture in his writing the details of his life. Orwell was smart and resourceful–he wasn’t as down and out as the people he wrote about, and I sometimes wonder, myself, how possible it is to be truly down and out with a few decent job experiences and some master’s degrees. Orwell inspired this blog from its beginnings, when I hyperventilated at the thought of my student loans and struggled with constant temptation from The Road. The focus of this blog has shifted over the years as I’ve traveled on a shoestring, written literary criticism while working the night shift in Antarctica, and started writing for About.com as the Survival Skills Topic Guide. Though some things in my life have changed, I still shudder at the thought of student loans, and I still long for The Road. Glad you are well dude. Hope to read more of your adventures soon. Merry Christmas down there. I’m in that Leaky Tent too! I look forward to catching up with you there. Traci, I’m so proud of you, girl! I supported you in Colorado as fellow writing instructors in our writing program and with your VW van departure to California… and still think you rock. Live on in adventure and passion. Thinking of you! Glad to see you are well. I am proud of you for following your heart for literature and passing on PT school. Much peace and many blessings. I love reading about your new adventures on here! I’m proud of you as ever, glad to hear you’re still at it! Keep in touch! I enjoyed your writing. I just stumbled upon your blog while Googling “Do Not Go Gentle,” a poem I’ve always loved, and last night decided to memorize. So now that it’s mine forever I thought I’d check out what others had to say about it. This wasn’t what I was expecting, but entertaining nonetheless. I’m a little wistful about your alternative lifestyle. Thanks for sharing it. Wow – What an amazing life you have! I stumbled upon your profile on the e-learners website, and just had to check out your blog. Good luck with your book! And if you come to Baltimore to visit the Goucher campus and need any Baltimore information, get in touch, I live around the corner! Just came by to say hi. Hope all is well and happy holidays! Well, look who has a blog. And seems to be pretty famous at that! Good for you, glad life has turned out so well for you. Remember breaking your brand new Trek 10 years ago? That picture is kind of famous on the net these days. Funny, huh? Drop me a line if you get a chance, would love to see how you’re doing. Hey, saw you name in Skype, checked out your blog, then found entry about Bastille. Well it’s today and looking forward to a big night out, though keeping away from the super strong beers this time. What date you over? Hey Traci. I do enjoy your blog. Speight and I were talking about you and it always reminds me to read up on what you’re doing. I love to travel and since I’ve had 2 tiny babies, I have this odd fear of taking them over seas without Gabe. I’m thinking I’ll venture to Bali in the spring with at least one of them though. My father in law lives there, so he would be of help. Anyway, keep up the travels and keep in touch with at least one of my family members. It means a lot. Hello, Traci. Just found this blog and impressed/jealous of all your travels! But most of all, the apt. in Vail and the red, VW van make me want to buy a plane ticket to Colorado and get in that fresh air! my best friend and I are contemplating picking up and moving around boulder in jan, want to do a lot of hiking and skiing and all that good stuff. anyway, i graduated with a journalism degree and admire how you’ve gone after freelance work and made it work for you. way to go. i’m about to mail in a query letter of my own, but for a book not an article. anyway, peace to ya. if you have any advice for a young writer i’m all ears! When you say that Orwell was not as down and out as the people he wrote about, you make a very good point. In the latter part of the book somewhere he considers who hard it is to be unemployed when you have few mental resources, how boring it is. Are the photographs on the blog all yours? I am curious about using on of them in the Earth First! Journal, a non-profit environmental publication. Can you contact us and let us know if this is ok? Traci Macnamara, glad to see you living life. More people need to do that. Rattling great visual appeal on this web site, I’d rate it 10.